As of Wednesday afternoon, the woman has been found. 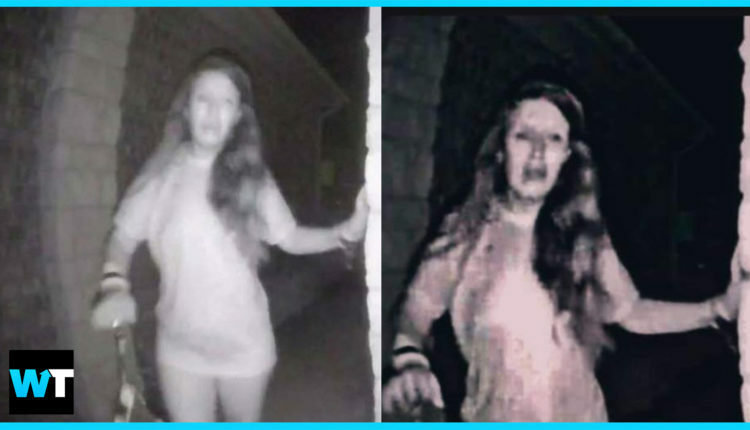 Texas authorities are scrambling to find out the identity of a mystery woman in Texas who was seen in broken shackles, ringing doorbells. The Montgomery County Sheriff’s Department released this surveillance footage from a suburban home about 50 miles north of Houston. The footage depicts a woman who appears to be wearing only a t-shirt and shackles on her arms ringing a doorbell. Police don’t know who she is, where she came from, or where she went and people in the community are hoping she’s okay. The residents of the house said the woman was gone by the time they got to the door, and you can’t really blame them for not rushing – it’s got to be jarring for your doorbell to ring at 3 in the morning. The Sheriff’s Department is hopeful with the number of tips coming in, but are warning people not to speculate. Of course, speculation is rampant now that the surveillance video has become national news. The comments on the Sheriff’s Department’s YouTube channel are full of conjecture about the video, some people thinking the “shackles” are just a lanyard with keys, or that the woman might be pregnant. According to a statement from the Sheriff’s office, people from across North America and Canada have been sending missing persons flyers, believing the woman might be their loved one. But, the Sheriff’s office says, none of them are confirmed to be the woman in the video. Caitlin was also 1 or 2 months pregnant at the time of her disappearance. Rachael believes stills from the video can confirm that the mystery woman has the same identifiable tattoos as Caitlin. But, those claims are very difficult to verify, given the quality of the surveillance video. Now, of course, a kidnapping or abduction is pretty much the worst-case scenario here. The surveillance video is similar to one from Toronto just last week, with a victim attempting to escape her kidnapper. The homeowner wasn’t home at the time, but turned that surveillance video over to police. The woman was found alive and in good health, and a Canada-wide arrest warrant has been issued for her abductor, 27-year-old Jonathan McLennan. A similar ending can only be hoped for the woman in the Texas video who remains missing. The Montgomery County Sheriff’s office reported that they discovered who the woman is — a 32 year old currently staying with family out of state. However, deputies discovered her 49 year old boyfriend dead Wednesday morning, dead of a possible suicide. As more information comes in, we will report it. What do you guys think? Are all the leads being sent in helpful or hindering to investigators? Let us know in the comments or on Twitter at @WhatsTrending.